Are you feeling adventurous? 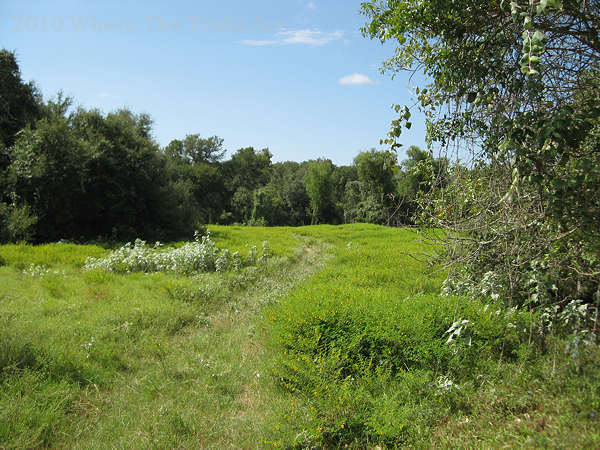 Then visit Lazy F and explore miles of unmarked trails. Hours: Make arrangements ahead of time with Clay through e-mail or phone before arriving. Once you get to the main guest house the owner, Clay Allen, requests you make yourself at home and give him a call. He will meet and greet you there. You can drop off your fees and provide proof of Coggins. Clay can then update you on information regarding the property or answer questions you might have. -From San Antonio – Take US 87 toward Victoria. Go to Smiley Texas. At Yellow Blinking Light in Smiley, continue on 87 toward Victoria for approx 4.5 miles. Look for FM 1116, turn left (only way to turn). Go 1 mile (cross Sandies Creek bridge) and look for large white cattle guard on right that says (LOS ARROYOS LAZY F RANCH). Turn in and go to main house. -From Austin – Take US 183 to Luling (4 way stop at RR tracks). Continue straight on US 80 to Nixon (to 4 way stop at US 87 – Dairy Queen and Tiger Tote). Turn left on US 87 toward Smiley and Victoria. Go to Smiley Texas. At Yellow Blinking Light in Smiley, continue on 87 toward Victoria for approx 4.5 miles. Look for FM 1116, turn left (only way to turn). Go 1 mile (cross Sandies Creek bridge) and look for large white cattle guard on right that says (LOS ARROYOS LAZY F RANCH). Turn in and go to main house. -From Houston – Take I-10 to US 97. Turn left on US 97 at Waelder (second exit) and go to Gonzales. As you enter Gonzales there is a 4-Way Stop Light at a small shopping center on the left where the American National Bank is located. This is US 90-A, turn right. Continue on US 90-A past WalMart, Tractor Supply, Caraway Ford, Guadalupe Valley Electric Coop, and continue through the stop light past MacDonalds. At the stop light at US 183 Bypass and US 90-A (Bucees Convenience Store and Fuel Stop) turn left. Leave Gonzales towards Cuero past Independence Park. Cross the Guadalupe River Bridge and go 1 mile to the “Y” at US 183 and US 97 (to Nixon) (located in the “Y” is Circle G Truck Stop and Convenience Store). Bear right on US 97 and go 1 mile and cross a long low-rail bridge and turn left on FM 1116 (only way to turn). Go 15.5 miles (you will pass through the town of Pilgrim). Look for large white cattle guard on left that says (LOS ARROYOS LAZY F RANCH). Turn in and go to main house. If you go to US 87, turn around and go back 1 mile. -From Houston – Take US 59 to US 87 in Victoria. Take US 59 from Houston to Victoria. As you are coming into Victoria on US 59, take N. Loop 463 to the right and go around Victoria to US 87 (approx 7 miles). Take US 87 to Cuero, being careful to turn left on US 87 at McDonalds across from the Exxon. Approx 3 miles out of Cuero, you will cross the big iron Guadalupe River Bridge, remember to bear to the right at the “Y” and stay on US 87. When you pass through Westhoff, go 7 more miles. You will top a hill with a Sprint PCS telephone tower on the right. Cross both the big bridges and go 1/2 mile further to a sweeping left hand curve in US 87. In the curve is FM 1116 to Pilgrim and Gonzales. Turn right on FM 1116 (only way to turn). Go 1 mile and look for large white cattle guard on the right that says (LOS ARROYOS LAZY F RANCH). Turn in and go to main house. If you miss it and go to the town of Pilgrim, turn around and go back 3 miles. Mileage: Unknown at this time, however, there seems to be plenty of trails. Cost: Prices may change so please call Clay for the most current information. Running water, a bathroom in the main house, pens, a hitching post, several cabins, and a pool. 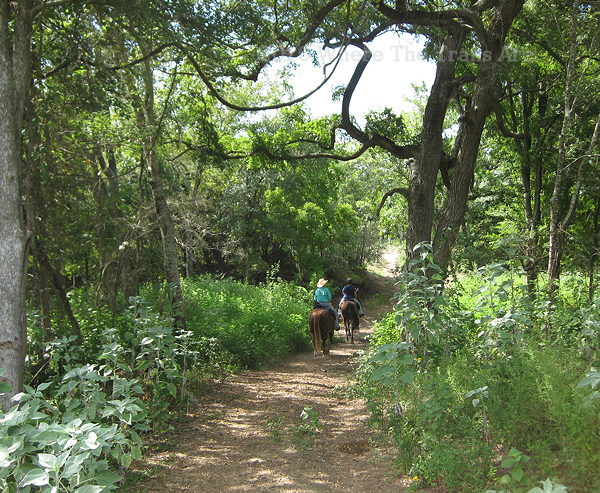 The Lazy F Guest Ranch is a working cattle ranch owned by Clay Allen which has been in his family since 1853. 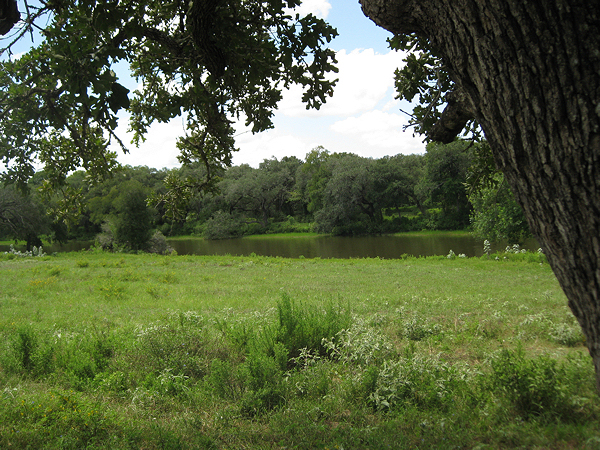 The ranch is 2500 acres and about four square miles. Clay makes it clear that he is not running a dude ranch which you will read on his website. 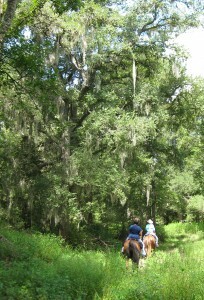 Clay invites day riders to his ranch or weekend to overnight campers who bring their own horses. 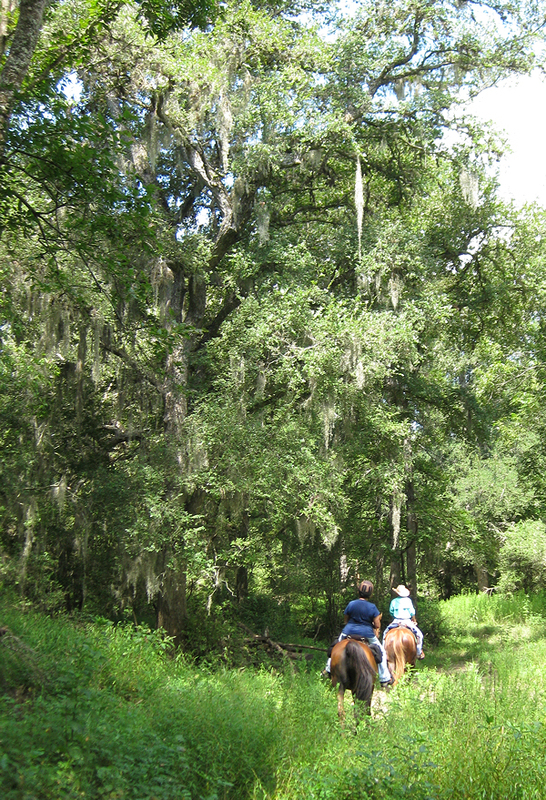 However, he also has horses available on the ranch for his guests who participate hands on in daily ranch operations. His guests come from all over, including overseas. 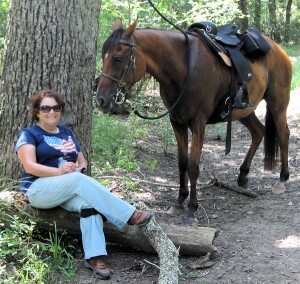 He offers several different programs for guests, caters events, and has some organized trail rides. He continues to work on improving trails and stated he would like to get them marked and mapped out. The ground is sandy with few to no rocks, horse shoes or boots are not necessary. 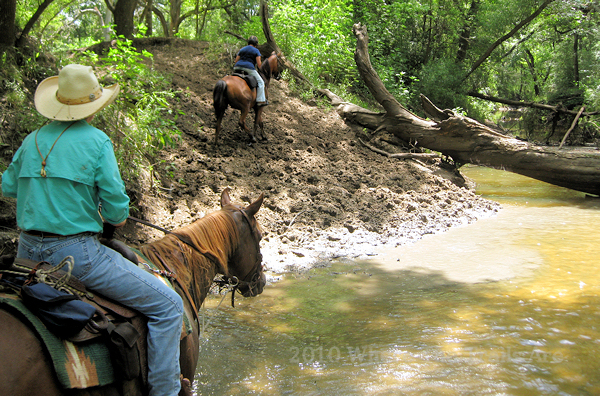 Creeks and ponds are scattered throughout providing adequate opportunities to water your horse, cool off, and enjoy. Despite being the beginning of August the vegetation was lush and a variety of wildflowers abounded. 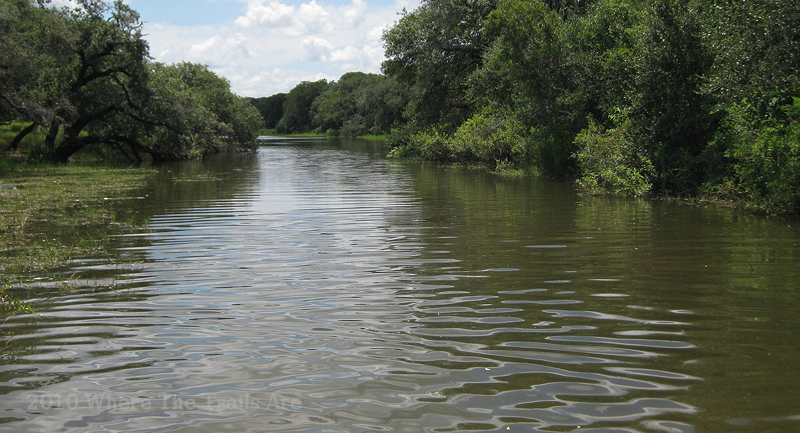 The property offers wide open areas as well as shady wooded trails. Cattle roam the ranch so be sure to latch the main gate closed when starting out down the trail and returning. On this ride the cattle were shy, only dust clouds and their bellowing alerted us to their presence. Pack a lunch as there are plenty of shady spots for a picnic and enough trails to build up an appetite. We enjoyed a peaceful lunch. The trees were perfectly spaced for tying off our horses, not too close or too far apart and a log could not have provided a better seat had the sun not managed to peek through the trees. The shade provided by some gorgeous oaks gave us a much needed respite from the August sun. Only one man made hazard presented itself on the trail, metal pipes were seen in our first creek crossing. The water is shallow in that crossing so be sure to keep a look out. Next time I’ll work on getting a GPS reading so we will have the exact location of this hazard. I’m looking forward to riding at Lazy F Guest Ranch again. 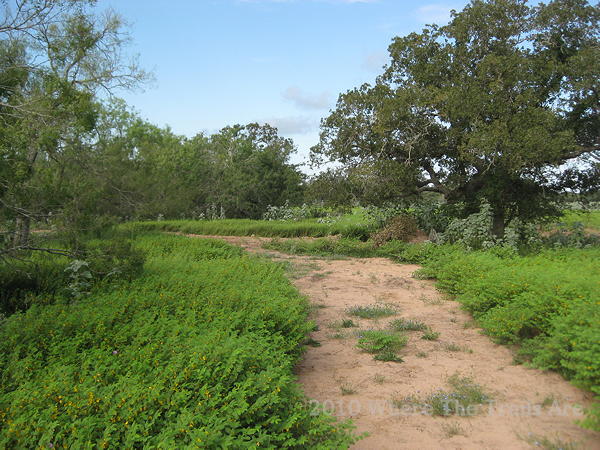 The ranch exhibits some gorgeous southern Texas country. Clay is friendly and welcoming. Next time I’ll remember to pick some pears before heading home. 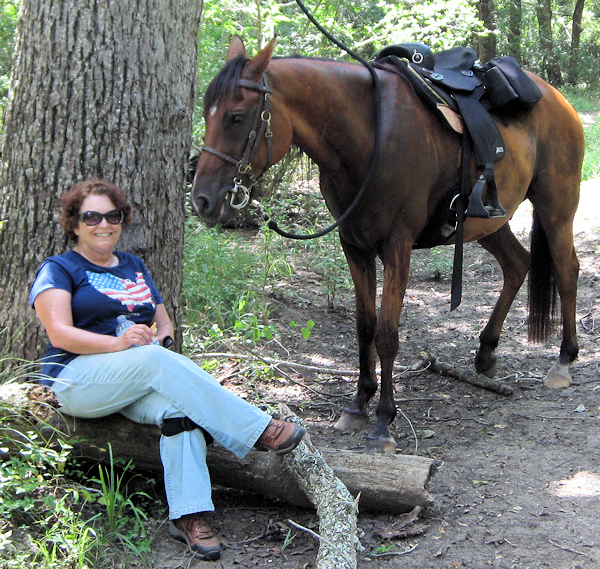 Carol and Ace enjoying lunch and rest in the shade. It was with some hesitation that I trailered down with Kelly to this new (for us) ranch. My hesitation was due to the recent scorching heat and humidity combined with my wimpy self…! We were treated to plenty of room to park by a very friendly host. After welcoming us he generously allowed us the freedom to ride where we wanted. 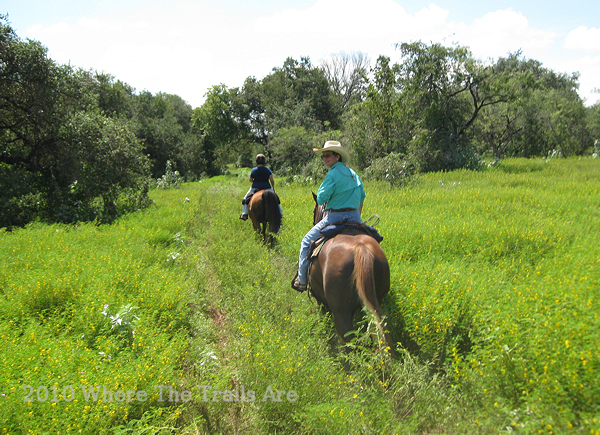 There were many varied and unusual types of wild flowers and plants to enjoy, a blue Texas sky, and good riding partners. My hesitation turned to pure enjoyment! 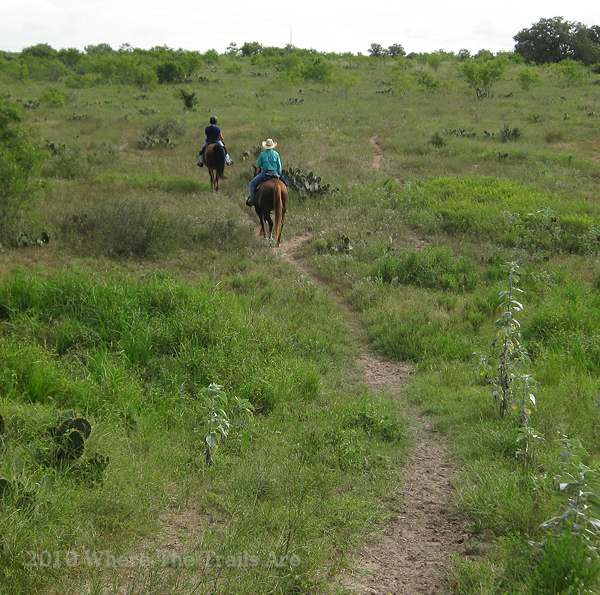 Kelly clicked away with her camera and visually recorded the Texas ranch and equine beauty surrounding us. What a thrill to see a beautiful part of Texas from the backs of our horses! 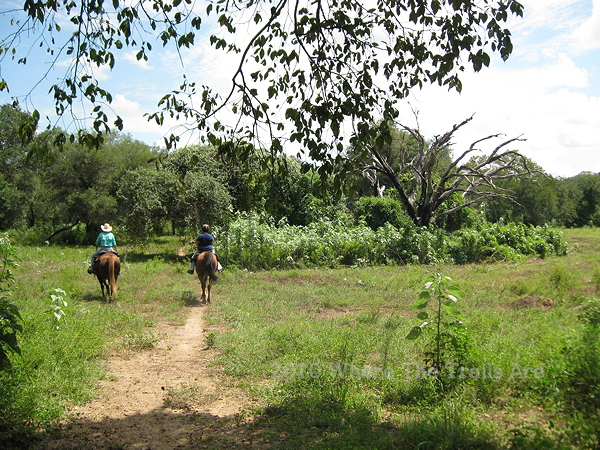 This will definitely be another great trail riding destination to add to our growing list. Be certain you do not pass up a chance to enjoy this ranch. Happy trails! Thanks Carol and Newt for joing us! Taking a dip in the water crossing just behind the ranch guest house was a refreshing way to cool off Angel and finish the ride.